Colorful visual reference of various stages of rock transformation. From magma to sediment, this large poster clearly depicts the various segments of the rock cycle with graphics, photos, and explanatory text. Follow the path rocks take as they change into igneous, sedimentary, and metamorphic forms, and learn the processes responsible for the changes. This includes cooling and crystallization, weathering and erosion, lithification, metamorphism, and melting. 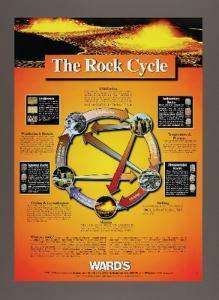 The photos on the poster display examples of common rocks from each type and rock formations showing the rocks in their natural state. Poster size: 27W x 38"H.